The last day of August, a Sunday, and yet another fine summer day to spend doting on my pile and other backyard gardening duties. This summer has been as delightful here along the coast of southwestern Connecticut as the winter was bad. The weather has been hot and dry, with just enough dousings from summer thunderstorms to stave off outright drought. After setting the rainbow sprinkler to arc across the sunniest part of my flower bed, I head over to my pile. It sits in patient, ancient repose, Sphinx like, its flanks covered by weathered, crumbly detritus. I’d gleaned from one side five wheelbarrows of raw compost for my vegetable garden, and from the other four for the recent transplanting among the flower beds. The rest of my pile will soon be broadcast across my lawn, following the aeration I plan to do over the upcoming Labor Day Weekend. It’s been several weeks since I stopped inserting fresh materials into my pile. I’ve filled one garbage can with sandwiched layers of kitchen scraps, shredded paper and additions of raw compost, and have mowed the lawn twice with strips of duct tape that seal off the bag catcher to mulch the clippings back into the turf. Today my goal is to get to the bottom of my pile, at long last. I want to see if it’s fully cooked and ready to be served. I’ve tried before, but my pile always collapses on and into itself before I can reach its epicenter, the part of it I first laid down last November. Finding the very beginning of my pile is like tracing the precise source of a river. I may never be able to pinpoint the wellspring, for after 10 months of poking and prodding, my pile has morphed and moved in place. Through the winter and spring I excavated holes across its top, reaching deep with the pitchfork. Did I touch the core? Perhaps. After working the right side of my pile last week, I know there are few places within it that I haven’t fully turned over and outward. I decide to dig into the left side, using the pitchfork to tease out tightly compacted dark earth from the bottom; it looks like the bricks of peat I’ve seen being cleaved from Scottish bogs. The inner core of my pile yields a clutch of raw leaves, undisturbed since last fall. 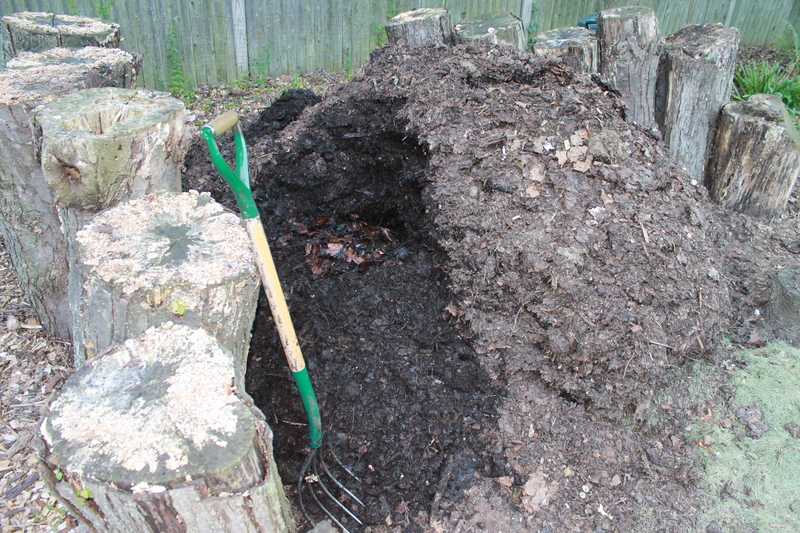 The chunks of compost crumble easily, with a texture of spent coffee grounds. A few sea shells drop through the matrix. I pierce a shred of tightly bound Sunday insert newsprint, from the bottom of my neighbor’s Angora rabbit’s hutch, tossed into a hole in my pile sometime late last winter. I dig into and under my pile, excavating a wide cavity below an overhanging ledge of compost that trembles with each thrust of the pitchfork. I uncover a clutch of maple leaves, glistening wet but otherwise pristine. I lift them up out of the burrow and set them aside just before my pile collapses back onto itself. For the better part of a year, I’ve been a good steward of my pile. I’ve tossed and turned every part of it, or near enough. I’ve mulled it over, lavished it with copious amounts of offerings. Soon I will not only get to the very bottom of it but cast my pile wholesale across my yard and garden beds. Sometimes, the end result turns out not to be as important or interesting as the process of getting there. I can’t quantify exactly how much my pile will add back into the biomass that is the suburban property I keep, but I know all that it has given me to date — a year’s worth of mental musing and physical effort — and a ton or so of the best soil amendment on earth. I will miss my pile, this particular edition of it. But it’s time to let it go, to return it from whence it came. Besides, seeing the brown leaves that are now falling across my lawn of late summer, I know my pile will soon rise, phoenix like, again. It’s now the third week of August, a dry spell that has seen only one good rain over the past three weeks. I’ve spot-watered the vegetable garden and a few of the perennials in the beds that line the grass lawn that surrounds the house. I have yet to water the grass this summer, aside from the drops that fall from the rainbow sprinkler when it arcs beyond the vegetables growing in the fenced-in patch bordered by the house and back patio. But still, the turf keeps growing and remains thick and green; surely it has benefited from the compost I have spread across it over the years and the aeration that allows the roots to extend deep down into the soil profile to chase after water and nutrients even through the dog days of summer. I’ll mow in the coming week and grass-cycle the clippings back into the turf. My pile needs no more hot greens this season. More than a week’s gone by since I last turned my pile, and today after work I decide to dig back in to finish a long-awaited task I began yesterday evening. It’s harvest time for my pile, with the first takings to be spread across the vegetable garden. Rain is forecast for the weekend; all the better to time my yardwork. Last night I weeded the small patch of vegetables in the raised bed I’ve fenced in the back corner of my house. Truth be told, I spend more time each year tending my pile, but I do grow a handful of tomato plants, some arugula, basil, cilantro, kale and lettuce – more than enough to keep me and my neighbors in salad the summer long. Cucumbers and beans grow along the low wire fence. Tall, spiky cleome and some other flowers bloom the summer long in narrow beds that border the fence, self-seeding each year and throwing off enough seeds to keep a covey of dove happy the summer long. The flowers that grow thick along the fence of the garden do a fair job in keeping the deer at bay, though this summer they’ve nibbled the vines of cukes and beans that have spread beyond the fence. This summer my next-door neighbor brought over some collard greens, fennel and dill that she’d started in pots. Lacking a garden, she asked if I’d grow them. Now all are in fine fettle, and most evenings she or a daughter comes by to cull the day’s take of cherry tomatoes or pluck a handful of greens for the night’s salad. It’s now time to cull the riot of spent flowers and vegetables — the greens I planted in the spring have mostly all bolted — and prepare for the fall planting of more lettuce, kale and arugula. I enjoy the cleome most of all, for their profuse flowers and for the small, banana-shape pods that produce an amazing number of small seeds that look just like poppy seeds, to which the dove that flock to my backyard seem addicted to. I cull a handful of seed pods from the cleome stalks most every day and spread them onto the flagstones of my back patio. I can hardly go outside my back door without a dove or two or three taking flight. They perch on the top of the roof, biding their time while I set up shop at my pile, then flutter back to the ground to continue their feast. In addition to finding a stray stem of crabgrass or two lurking among the greens – and about to go to seed – I had some major “weeding” to do in my garden last night — at least when you define a weed as any plant in an unwanted place. The fennel has grown tall and lanky and bends over the fence; two of the tomato plants have withered with rot, and the potato, cucumber and watermelon vines have sprawled across the beach-brick path. The biggest and best surprise of the day comes when I tug at the potato vines. Early in the spring my neighbor had brought by a bag of rotting potatoes from her fridge. I cut up a couple with the most prominent eyes, planted them in the garden and then mostly forgot about them. Potatoes are very much an under the radar garden planting. But today I pluck the two sprawling plants from the ground and find their roots are a mass of potatoes, looking just like the ones I find in the bin at the grocery store. Most weedy are the strawberry plants that virtually taken over half of the garden. Though they produce a couple weeks’ worth of very tasty berries each May, they have overwhelmed my small garden patch. I spent an hour or so ripping out the most of the vines, leaving only a small patch in the back shady corner of the garden that I promise myself I will restrict the strawberries to next year. Hating to waste so many viable fruit plants, I tease out a dozen or so of the biggest clumps of strawberry roots and save them for my across-the-street neighbor, whose daughter is the garden’s main strawberry picker. He’s promised her that next year they’ll have their own strawberry garden. The rest of the garden trimmings I pile together and, using the long, weedy fennel plants as a sled, drag the lot over to the side of my pile. These fleshy vines and hollow stalks will make a fine, fluffy base for next season’s compost heap. Out with the old, in with the new. 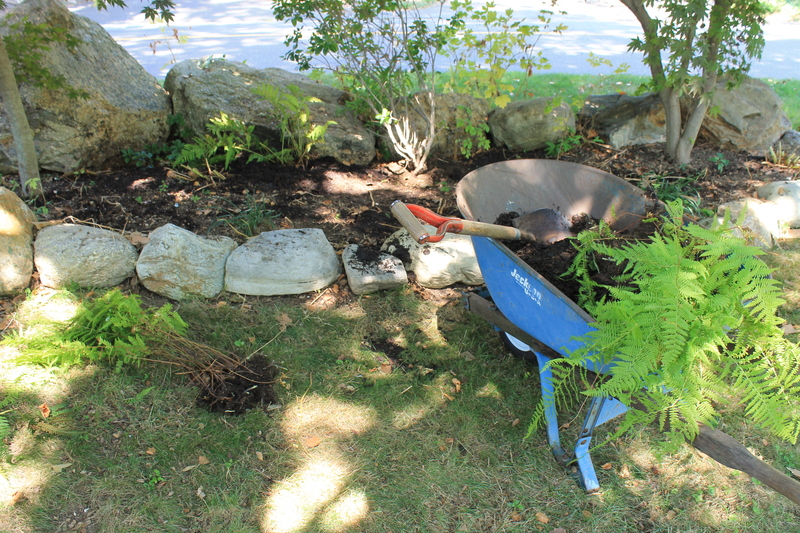 After dragging the overgrowth of spent fennel and tomato vines from the vegetable garden, I begin the harvest of my pile, adding wheelbarrows of fresh compost back into the garden. Having ripped out much of my own strawberry field, I now have a bare patch of garden. I will soon plant for the fall season, but first what my garden needs is a bumper crop of compost from my pile. So tonight after work I head out to the backyard to begin the harvest of my pile. I start at the front, which I’d worked the week before. 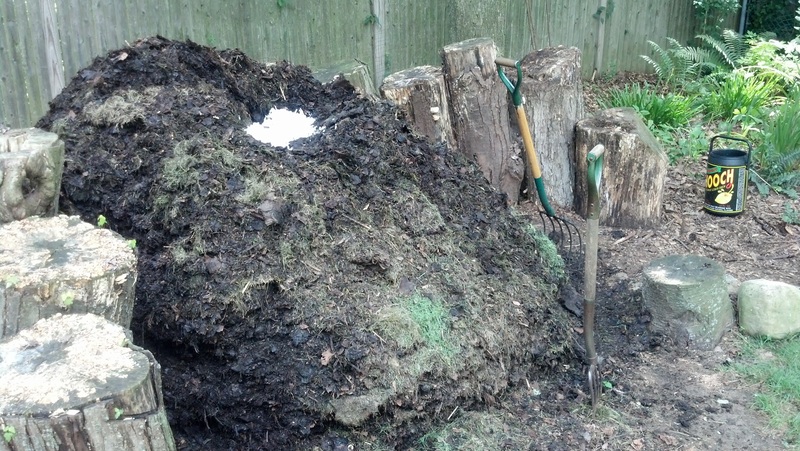 The compost holds together just enough for me to use the pitchfork to fill the wheelbarrow. I don’t bother to screen it, though I stop occasionally to pluck out a wood chip or piece of broken branch or toss a pancake-sized clump of leaves back onto the top of my pile. Having just been turned and now mostly matured, at least this part of my pile is cool to the touch. I’m delighted to see all the worms that have squirmed their way back into the mix, and happy to transport them along with the compost to my garden. The barrow fills quickly, and I wheel it across the yard to the garden to toss shovels in and around the plants, on both sides of the fence. Within a few minutes, I’ve spread five wheelbarrows full of compost across my garden, which measures just about 20 feet by 20 feet. It’s a chore I do every August, to give the plants protection from the withering heat of late summer, and a layer of absorbent organic material to soak up and retain what water I give them. 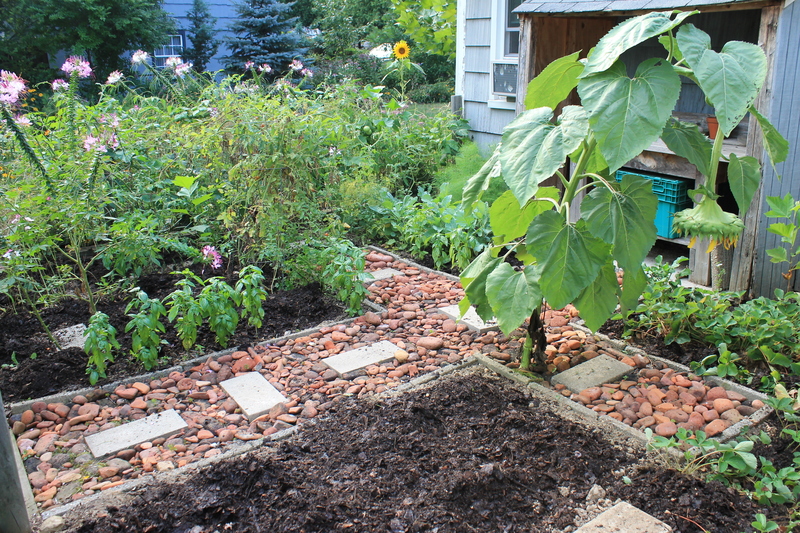 An “after” photo of my vegetable garden, which accepts all the compost I can give it. Later in the fall, when the last of the tomatoes stay green on the vine, I’ll cull the rest of the plants and spade in the compost. I started the garden a decade ago from bare dirt; over the years I’ve added enough compost so that now its surface is raised to the level of the 6 x 6 wood beams that gird the base of the wire fencing. After extracting five wheelbarrows of compost for my vegetable garden, I’ve hardly made a dent in my pile. It’s the home stretch for my pile in its annual cycle of transformation from an assemblage of dead leaves and such to a new life as the mysterious thing known as humus. I’ve nurtured my pile as best I can, adding at regular intervals copious amounts of fresh green organics — of all manner and in varying states of decrepitude — as well as regular replenishments of decaying old browns, natural and manmade, and other essentials, like water and pee and sand and soil. The process has kept my property tidy, given me a scavenger’s joy in sourcing such an array of recycled contributions, and provided a steady outlet for physical exertion and mental musing. It all adds up to a very large heap of moist, dark crumbly organic matter sitting in the corner of my backyard. 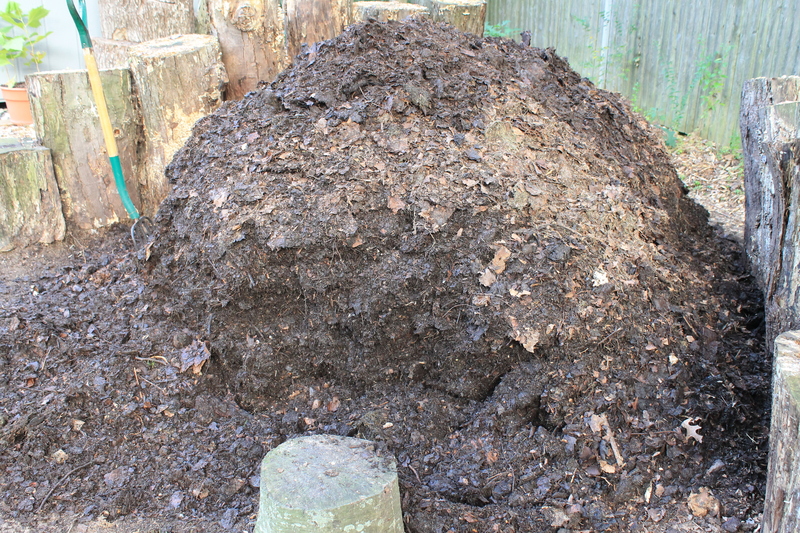 For the past weeks, I’ve largely left my pile alone, trusting its inner workings to complete the job of turning all these elements into a finished product – part fertilizer, part soil amendment, part good, ol’ fashioned dirt – that I will soon spread across my lawn and garden, and share with neighbors. Today after work, it’s time to dig back into my pile and give it a good turning. Over the past couple of months, I’ve infused the ever-absorbent and accommodating heap with an ample supply of grass clippings, pulled weeds and other trimmings, as well as the leftovers from my kitchen and coffee pot as well as food waste from my neighbors. I’ve poked and prodded and carved up my pile as best I can to add air and help mix and disperse the yin of matted brown leaves with the yang of the ripe-to-rotting organic material that will meld with it. Despite my efforts to blend my pile all together, there are still parts that remain untouched since last fall – the deepest, darkest parts of the base. I want to get to the bottom of my pile. I’ve tilted back one side of the log wall that contains my pile to excavate its inner reaches. Note the dried leaves in the crevasses. I know from year’s past, as well as my recent excavations, that there remains a layer of compressed leaves at the core of my pile. Like an Egyptian archaeologist opening a pharaoh’s tomb, I also know that once exposed to light and air, these long buried leaves will quickly crumble. That’s the goal at least. I have another chore, and that is to find a repository to stockpile the continuing pile of kitchen trimmings and other compostables as my pile matures. For the first time this year, I’ve decided to cut off my pile from having to ingest fresh fodder and instead create a starter batch of compost. My packrat of a neighbor has several extra garbage cans he doesn’t use, so I borrow one with a lid and set it up on the opposite side of the log wall that I’ve splayed to get to the side my pile. It’s a good spot to park the can as I harvest this year’s batch of compost and prepare for the next season’s haul. I fill the bottom with a layer of pieces of sycamore bark, then cover those scraggly bits with half of my regular supply of shredded office paper for a base of absorbent material. 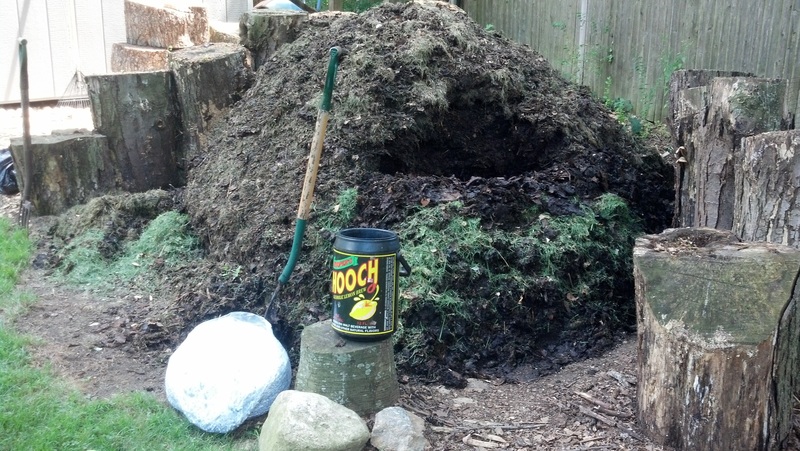 I top it with a pitchfork of compost from my pile, then upturn my kitchen Hooch bucket. I cover that small batch of leftovers and coffee grounds with another forkful of compost, filling up nearly half the plastic garbage can. My neighbors’ kitchen scraps fill a five-gallon white plastic bucket, and in it goes as well, a mucky supply heavy with corn husks, avocado skins and egg shells. As these are all slow to decompose, I’m glad I’ve made the decision to keep them out of my nearly finished pile, but worry that I may have just created a barrelful of stinky problems for the next month or so. But after mixing up the mess with a pitchfork and adding a bit more compost and the rest of the shredded paper, I put the lid on this small batch of compost, flipping up the handles to seal it up for a week or so. It’s air-tight at least enough to not attract flies, and surely the few stray worms I’ve tossed in will have the compostibles to themselves for the next few weeks. I plunge back into my pile with the pitchfork, relishing the simple task of digging through the loose matrix of crumbly proto dirt. I start with right side, which has been left unturned the longest. I pull the bottom layer forward and excavate inward, piling up the tailings across the three other flanks of my pile. I’m happy to see that the compressed leaves I fork out have turned to clod-like chunks that crumble into bits and pieces. A few of the largest pinwheel down to the slopes of my pile and break apart against the ground. Digging deeper, I come across a few flecks of white shredded paper bound together, a half-pipe of a sunflower stem I’d laid down last fall. Having served its purpose as an air tube, is now turned to a pulpy sliver. The pitchfork tangles on a snarl of fishing line, which I set on top of a log with a few pieces of plastic detritus from the beach. The buckets of seaweed I added to my pile through the fall and winter and even this spring are long gone, save for stray oyster shell and flecks of mica that glisten on the backs of dark moist bits of leaves. A clump of leaf mold impales itself on the curved tines of the pitchfork. I tease it off; pleasedto find that it’s warm to the touch. I search for sulfurous spots of matted grass but find only smatterings of yellow-green flecks. My pile has not turned anaerobic, as I’d feared, but has largely burned through the infusions of grass clippings I’ve added to it on through the summer. I come across a pocket of the maple seeds I tossed in recently. They remain obstinately intact, and I take care to rebury them in as deep as I can as I work my way down into the center core of my pile. I carve a wide hole nearly to the middle center before the top portion topples down into the chasm. My pile is no longer a lasagna-like layering of distinct components but more like brown cottage cheese. Much of it separates through the wide tines of the pitchfork before I can toss it up onto the pile. With the evening light fading, I decide I’ve made enough progress, and spend a few more minutes scraping the dried chunks of leaves from the perimeter of my pile and tucking them back up into its interior. Before long, I’ve reconstituted my pile into the squat pyramid that is its natural shape. Freshly aerated and rekindled, the nearly finished compost will continue to churn and burn until there it finishes consuming itself. My pile, nearly mature, after a thorough turning in mid August. I wake up early on a hot, dry Saturday morning in early August to tend to the garden. Later in the day, when my adolescent son finally wakes, we’ll head into New York City with our bikes to spend the afternoon exploring the city. Old men don’t need their beauty sleep, so I set to some gardening chores before hauling the bikes out of the backyard shed. One way to think of my backyard is vertically, perhaps a notion on my mind as I look forward to cycling through the canyons of downtown Manhattan. Seen this way, there are four separate layers to my landscape: the ground, which includes the lawn, groundcover and mulch beds; the annual and perennial bushes, flowers and vegetables that grow chest high each summer; the larger shrubs and small trees, like the dogwoods, lilac, rose of Sharon, butterfly bushes, forsythia, crabapple and collection of young hardwoods I’m raising, including a variety of oak and a strapping young hickory; and the mature canopy trees – sycamore, oak, pine, willow and maple, among them. My property, all third of an acre of it, is positively stacked. Each season it grows taller and thicker, which calls for some measure of cultivation. I pass by my pile to pull out the extension clipper and saw I keep in the tool shed. I stretch the flexible, two-part Fiberglass pole to reach some sucker limbs of the crabapple that grows, almost unseen, behind a patch of gangly privet bushes along the side of my yard that I’ve let grow wild and are now nearly 20 feet tall. Next I prune a sycamore that sprouted in the pachysandra bed alongside the west side of the house. I know the old-saw saying of never let a tree grow next to a house, but I am an indulgent gardener, and I’ve been amazed to see how fast the sycamore has grown in just a handful of years. It now rises 10 feet above my second-floor attic, and spreads wide enough to cast the entire west side of the house in shade. The benefit of a cooler house offsets any concern I have of the tree’s roots causing problems with my foundation. My house sits on cinderblock and has a dirt floor under the crawl space. If a root wants any part of that creepy-crawly space, have at it. To keep the sycamore from scraping up against the side of the house and roof, I trim the house-side of it espalier-style. Though now only half a tree in some respects, it’s handsome and robust. I’ll let it go another year or two and then decide its fate. The tree this intrepid young sycamore hails from lords over the front corner of my yard in a majestic if messy way. This sycamore is the largest living thing in the yard, if not neighborhood, and I spend more time picking up after it than all the other trees on my property. It sheds leaves pretty much throughout the summer, and each year I stretch the pruning pole upward to nip off the branches that hang low with new growth and heavy seed balls. Those sycamore balls begin to drop in the fall, bright green and as hard as a hockey puck. I used to gather them up by the bucket full to use as baseball practice with my son. As they ripen, the seed balls turn brown and soft with fluffy seeds. My son delighted in seeing them explode into puffs off his bat … until a dusty seedling caught in his eye, and then he was done with them. They plague me nearly as much as the maple winglets, sprouting everywhere they land, including the gravel driveway. The sycamore has another peculiar trait that adds one more chore: After the first heat wave each summer, the sycamore bark peels away from the trunk like a bad sunburn. 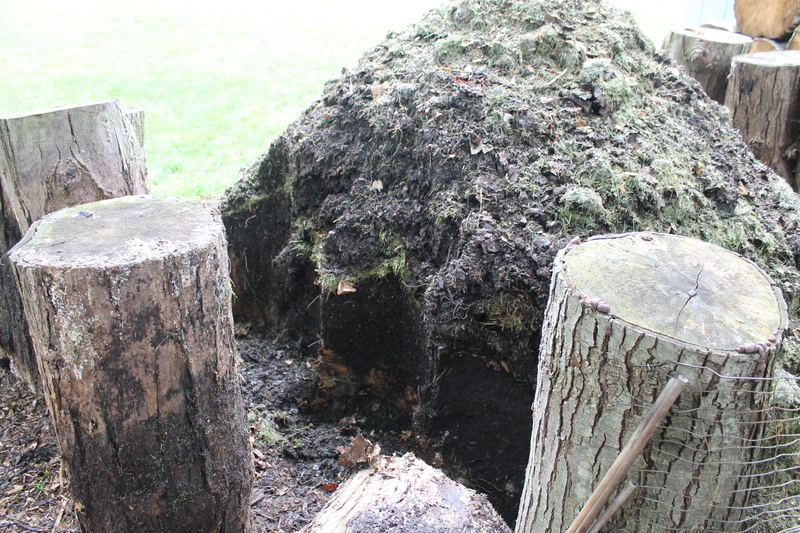 Whole chunks flake from the tree’s top to bottom, littering the lawn beneath the tree with brittle patches of bark. A mess of sycamore bark. Most of it gets mulched by the mower, and some I add to my pile. I’ve read that sycamore leaves are among the best to compost, so I tolerate the tree more than I should. I also like the look of the tree’s massive trunk and limbs, dappled in shades of cream, yellow and brown. 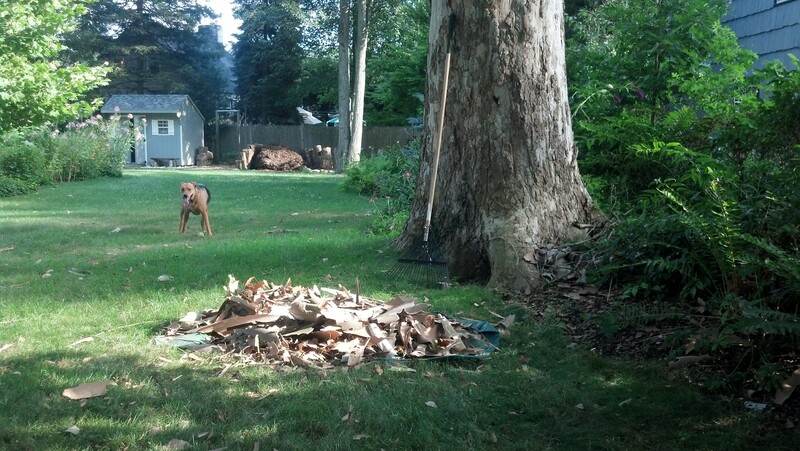 Most of the sycamore bark I simply mow over, but a couple times during the dog days of August there are enough to rake and pile onto my plastic tarp. I drag it caddy-corner across the yard to deposit next to the heap of cut limbs and other such prunings that I haul off to the town’s yard-waste refuse center. My pile sits untended, but if I thought today was a day away from compost, boy, was I wrong! Wheeling our bikes up and out of Grand Central, we cycle down 42nd Street to the West Side bikeway to head south along the Hudson. Our destination is Governor’s Island, where I’d read that a Civil War re-enactment will take place. My son isn’t much of a reader, so I figure this bit of living history will stand in for some needed summer enrichment. Plus, I get a kick out of taking the free ferry ride from South Ferry Terminal to the obscure old military installation, now closed, in New York Harbor. Of course, he wasn’t buying even this hint of “homework” on a summer Saturday. Coursing through the canyons of Wall Street, filled on a weekend with tourists instead of suits, we finally make it onto the island just as the Civil War cannons and muskets fire their last salvos. As we pedal to the southern side of the small island, we come across a section of old barracks that have found new life as Earth Matter, a hippiesh, communal operation dedicated to … compost. The community compost operations on Governor’s Island in New York Harbor. As we wander about the rustic, barnyard-like operation, almost literally in the shadow of the world’s foremost concrete jungle, we learn more: Earth Matter was founded in 2009, I read in a flyer, is a nonprofit organization dedicated to advancing the art, science, and application of composting in and around New York City. Its mission: to address the dual problems of resource recovery and healthy soils with a single solution: promoting the local composting of organic waste into a healthy soil amendment. I’ve stumbled across Ground Zero of urban composting. We stroll past long windrows of compost, each one planted with a sign that gives its date of creation. I envy the small front-end loader parked beside the nearest compost pile. 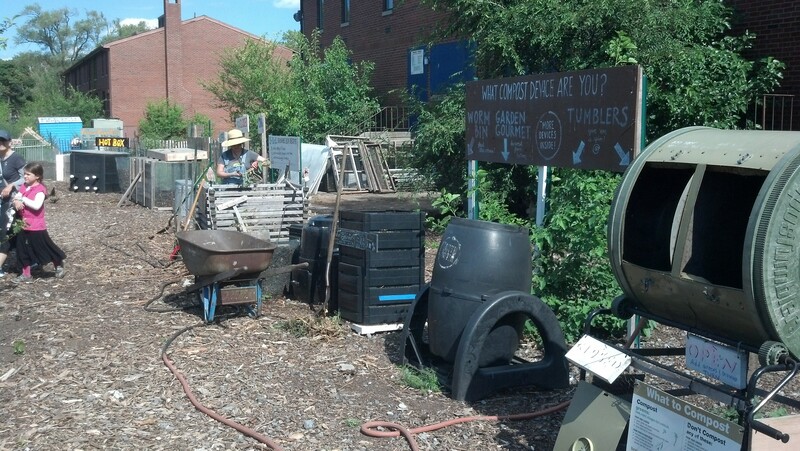 We wander past a demonstration area that has a row of different types of composting setups and contraptions, from tumblers to worm bins to a variety of fenced-in enclosures. Call it a dis-assembly line. “Not more like 150 degrees?” I counter. “Nope. 1,500,” he says with certainty. I package my few ounces of kiln-fired compost and thank the young man. I admire his passion, if not his facts. 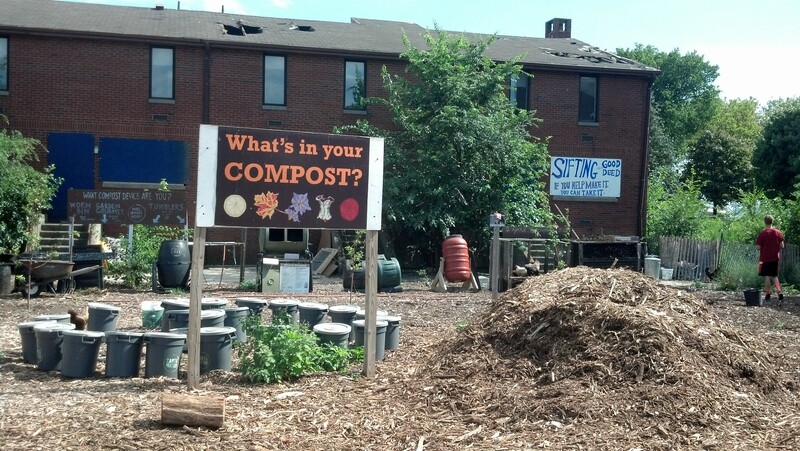 A view of the different types of composting systems on display at Earth Matter. Earth Matter NY seeks to reduce the organic waste misdirected into the garbage stream by encouraging neighbor participation and leadership in composting. There is one soil, one air, and one water, all commonly held and stewarded by one people, the nurturance of which is critical to a verdant world. Organic waste should not be part of modern landfills because the waste of any process is food for other processes. Transportation of waste far beyond the source unnecessarily despoils the soil, air, and water. Society needs to alter the way waste is treated as part of an integrated, long term solution to food, climate, and energy issues. The power to manifest global social change lies within each of us. The challenge to take action rests on our shoulders. Compost organic waste locally on behalf of our friends. Educate, encourage, and support ongoing community composting efforts. Utilize best practices for the improvement of soil health. Promote water conservation practices to reduce the Combined Sewer Overflow (CSO) burden on municipal sewer systems. My son and I may have missed out on the Civil War, but this serendipitous encounter is truly living history and a learning experience of its own. Arriving home from work this evening, I check the mailbox and find a business envelope, with a return address of University of Connecticut, College of Agriculture and Natural Resources. Inside is a sheaf of single pages, results of each of my three soil samples. At the bottom of the first page, in pencil, is a handwritten note. I check the tabular results for the compost sample. On the left of the page are four rows labeled Calcium, Magnesium, Phosphorus and Potassium. Stretching across the page are three columns, titled “Below Optimum,” “Optimum” and “Above Optimum.” The colored bars for all four key minerals extend into the last column, with Phosphorus stretching the farthest. My pile is off the charts! Another page is labeled “Modified Morgan Extractable,” and on it I see that my pile has 38.2% organic matter — which makes me wonder what the other 62% consists of. I compare the results for my pile with those for the vegetable garden and perennial bed, which I keep covered with annual spreadings of wood chips. One number stands out: The Nitrate-Nitrogen level for my compost pile is 150.1 PPM, vs. the mulched bed’s 19.1. The pH readings are 7.0 for the compost sample, 6.6 for the mulched perennial bed, 5.5 for the vegetable garden. Another page is a handout titled, “Interpretation of Soil Test Results.” It informs me that “soil pH is a measurement of a soil’s acidity. The pH scale ranges from 1 to 14, with a pH of 7 being neutral. Values below 7 are considered acidic while those above indicate alkaline conditions. The pH of a soil not only affects the availability of necessary plant nutrients but also the solubility of potentially toxic elements such as aluminum and lead. I’m pleased, if not downright proud, of the results across the board. My pile turns out to be extraordinary rich in nutrients, and I imagine as it continues to mature will increase its percentage of organic material. The vegetable garden, with its base of native soil, remains true to its slightly acidic nature, which I will address soon by adding a thick top dressing of compost. And I’m relieved that years of covering my perennial beds with wood chips and chopped leaves haven’t turned it acidic. I have a science-based answer to why my flowers thrive so well — and perhaps why the rhododendrons haven’t. And I’m happy to have received such personalized attention from a government bureaucracy. Thanks, Dawn! I celebrate with a quick mow of the yard. I’m rushing daylight and laboring under a steamy August night, so mow only the stretch of lawn where the grass and clover are most lush — which happens to be the precise area I spread a season’s worth of compost two summers ago. I mow around the perimeter of the front lawn, along the street where the windblown weeds take root quickest, but leave the interior to grow whole under the hot summer sun. Still, I gather two hopper fulls of fresh-cut grass clippings, which I heap along the front of my pile. I have a stuffed container of kitchen scraps to dispense with, as well as my neighbor’s ash can. They left town for their annual summer trip to the mother’s home country of Hungary early in the week, and I find the heavy can half full of food scraps, rotting in a pool of rank liquid. It’s been that hot of late, and the food waste has simmered into a ratatouille of rot — compost tea, some call it. I’m nearing the point of dispersing my pile through the garden, around the perennials and across the patch of straggly lawn that didn’t receive the last batch of compost, so I start my digging and turning in the left-rear corner of my square-cut heap of nearly finished compost. The heap has shrunk over time, and it now rests a foot or so away from the log wall that once contained it. I stab the pitchfork into the edge of my pile, the tines piercing into the dirt floor, to draw the piecemeal leaf mold along the bottom outward, back up against the two and tallest logs at the back of my pile. I scrape away, building up a back berm of freshly unearthed compost. It is moist and smells richly of forest floor. I sprinkle a thin layer of grass clippings across the top, and dig away to excavate a trench in which to bury my soggy week’s worth of kitchen trimmings. I bury the mess with scalpings of sun-baked leaf mold from the top and sides of my pile, and burrow further back and down until I reach a vein of leaves cocooned since last fall. If this isn’t the very bottom part of my pile, it’s very close. I turned out the old virgin leaves and cover them with a thin layer of fresh grass clippings, a May-December marriage if ever there was one. Burrowing into the bottom of my pile to turn out the old and bury the new. As I burrow my way back and down and up and in to this corner of my pile it collapses onto itself. It knows when it’s goose is cooked, and I fold another layer of grass clippings across the top, finishing the near-done humus with a basting of fresh, wet grass trimmings. This back corner of my pile rises high, bolstered by pitchforks of sodlike leaf mold that have tumble down along the flanks. I’m choosing this redoubt as my last stand — with my pile it’s LILO, last in, last out. I’ll harvest my pile from the opposite corner first, and give this blend of the latest kitchen scraps, grass clippings and the rawest of leaf mold as much time as it needs to ripen as compost. It’s this section that will likely form the base of next year’s pile. With more grass clippings and the neighbors’ soggy tin can of food waste to dispense, I work my way along the backside of my pile, digging a knee-high trench to turn out the old and bury the new. 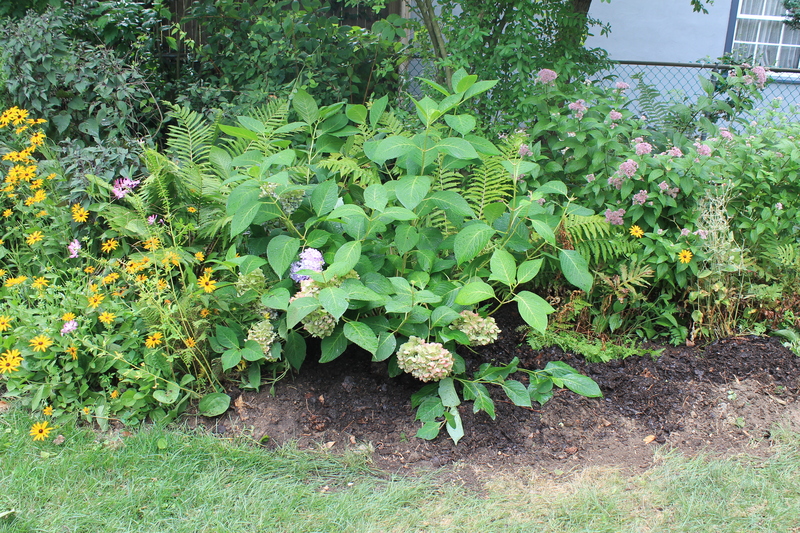 I tidy up along the edges to return my pile to the rounded heap of nearly finished compost that it is, only shape-sifted a few cubic feet into a fresh semblance of its former self. I finish in the gloaming of evening and step back to consider my pile, now at its most fulsome and accomplished state of being. I spend an anxious week eagerly awaiting the results of my soil test samples sent off to the UConn lab. It’s like waiting on a pregnancy test. Am I fertile? What if something’s wrong with my pile? Not that there’s anything I can do about it. I know all that’s gone into my pile, and know of its seemingly infinite capacity to absorb, transmute and transform the riot of raw materials into a finished product that is at itself not fully understood by scientists but invariably useful and productive to gardeners and farmers of every kind. Today, a Saturday and the first day of August, dawns bright and clear after a week of hot, muggy weather that was finally broken by a gully washer of a thunderstorm. The rains gave the yard and gardens and my pile a soaking down through the root zone and then back up until the low parts of the lawn were squishy under my shoes. I threw a tennis ball for the dog this morning, and his paws unleashed sprays of water; the tennis ball itself spun out its own galaxy of droplets. The heat wave stifled the grass, and for the first weekend in a month or so I don’t have to mow. Still my soggy pile of nearly finished compost could use a good turning. I have a clutch of mildewing grass clippings dropped off by a neighbor a few days ago. And I have a bucket full of summer kitchen scraps to dispense with more urgency than normal. While making coffee few mornings ago I was buzzed by a small squadron of fruit flies, hovering above the kitchen sink. Fruit flies are more an annoyance than a danger, but still a presence that no kitchen composter wants to tolerate. After clapping as many as I could mid-air, and squashing a few more with my thumb against the east-facing window above the sink, I check the Hooch bucket that sits on a glass-topped table to the side of the kitchen counter. No sign of an infestation, which after further inspection I realize comes from some spilled beer in the paper-lined bin I keep under the sink to stash my recyclable cans, jars and bottles. The bucket of kitchen scraps this week includes a handful of long-expired vitamins and capsules of fish-oil supplements. Before I take the Hooch bucket outside, I open the fridge to make one last sweep through the vegetable bin. I find nothing past its due date, but spot the collection of vitamin and supplement bottles that have long resided in the tray on the inside of the door. There’s a bottle of multi vitamins and two of fish oil supplements, dating from a long-ago new year’s resolution. Each one is more than half-full. I check the expiration dates and and am shocked to see that they are years out of date. I debate whether they should go in the Hooch bucket or the trash can, then check online for advice. While I know certain prescription drugs are now creating all kinds of hazards, up and down the food chain when flushed down the toilet or sent to a landfill, I can find no authoritative counsel on whether vitamins pose the same risk. I find some concern about the risk, especially to small children, of coming into contact with excessive amounts of iron, but after reading on one garden forum the comment, “hey, the pills contain minerals that are naturally occurring anyway,” I decide to chuck them into the Hooch bucket. The fish oil capsules will surely wash safely away, and I figure a handful of multivitamins ingested by a compost pile of my size, which will soon be spread across a third-acre of grass and garden, is an acceptable way of recycling such nutrients. I take the Hooch bucket outside and place it next to a plastic bag of shredded paper from the office. What began several months ago around tax time as an impromptu gesture has now been added to my job description: Whenever the small bin of the finance department’s paper shredder fills up, “the compost guy” gets the call to empty it. It’s a task that I am happy to have taken on. For one, the shredded strips of crinkled white paper have mixed well with the copious amounts of green grass clippings I’ve added to my pile’s crumbly brown heap of leaves and other rotting mixings. The dry, crinkly white shreds soak up the watery slop of kitchen waste — watermelon rinds and other fruit trimmings that are quick to putrify in the summer heat. For another, I see my recycling at the office as a fairly easy way to practice what I preach in my own backyard at the place where I spend most of my waking hours. And there’s this: I spent more than 25 years as a practicing journalist and until recently was always an avid consumer of printed magazines and newspapers. Over my career, I am at least partially responsible for the destruction of a large forest’s worth of paper. To recycle even a tiny portion of that highly processed product in my backyard is a way to atone for being an ink-stained wretch for so long. “Several paper products – especially newspaper and cardboard – are useful in the garden and landscape. While it provides no nutrients, paper is organic material, made primarily of wood fibers. 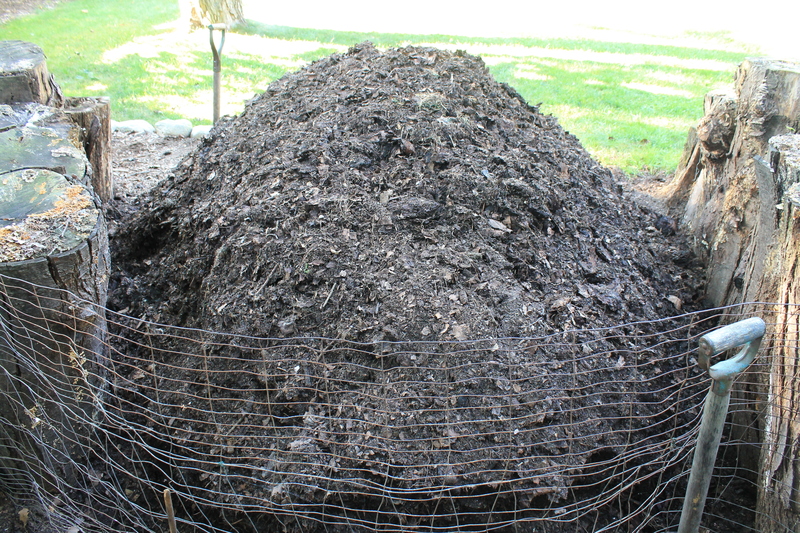 It decomposes slowly but provides structure when used in a compost pile. “Shredded newspapers or telephone books are good paper choices for composting or digging into soil directly. They decompose well when mixed with high nitrogen products such as manure. Shredded newspaper may also be used under other mulches in the landscape, where it is broken down by earthworms. Of course, I take the glossy ad inserts, junk mail and the like to the local recycling center, as well as the newspaper I don’t use as kindling to start my fireplace in the winters. Years and years ago, while living in New York City, I helped a buddy fill up his parents’ Volvo with a half-year’s supply of New York Times. Our orders, in exchange for spending a long weekend at his parents summer cottage on the North Fork of Long Island, was to spread the newspapers wholesale across a section of their garden. We carpeted the weedy ground with sections laid tight together, circling close around any perennials. This was a practice they’d done for years, and worked well. In another part of the garden, “all the news that’s fit to print” had smothered the growth as it slowly degraded from newsprint to papier mache. I grant the Cornell Horticultural experts their concerns about adding shredded office paper to a compost pile, given the potential risk of dioxins. 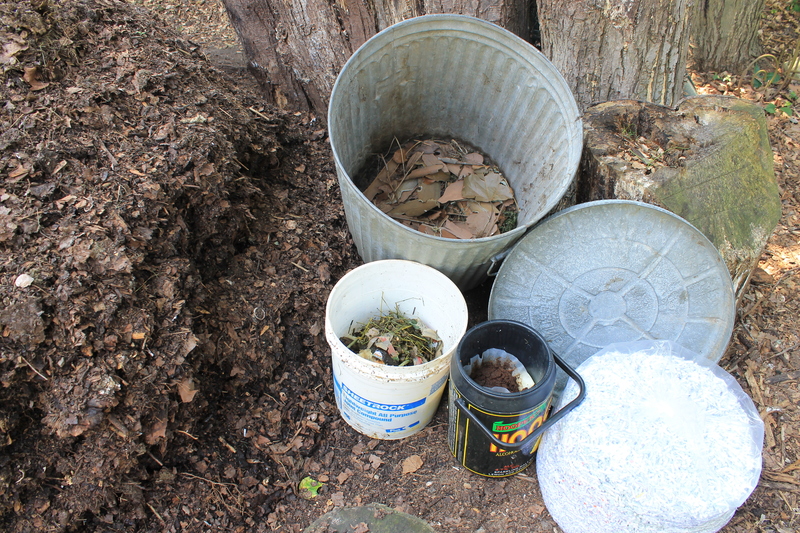 But the consensus among avid composters is that adding shredded paper is on balance a good thing for the environment and backyard heaps, provided you have a good supply of greens to keep the carbon to nitrogen ratio in balance. Plus, I have to trust the earthworms and their microbial allies that inhabit my pile to digest trace amounts of toxins and render them more harmless. It’s a good feeling, mine and the worms’, and I’m going with it. At this point in the summer, my pile is easy to work with, and through. I dig a trench along the back side that becomes a hole that allows me for the first time since last November to reach the core of my pile, the very bottom of the center. Using the straight-tined pitchfork, I tease out some surprisingly whole leaves and turn them out onto the top of my pile. I cover with a few scraps of rotting grass leaves. Into the hole at the center of my pile go the kitchen scraps and the shredded paper, mixed with crusty leaves scraped from the sides and along the bottom edges of my pile. My pile will have no trouble digesting this shredded office paper, mixed with grass clippings and kitchen scraps tucked deep inside its core. My goal is to mix and bury the new material with as much of the undigested parts of my pile. With the calendar now turned to August and 10 months into this season’s batch of compost, I figure my pile is only about four or six weeks from being dispensed with. The shredded paper, evidently much loved by earthworms, has until now always disappeared without a trace. By now my pile is mostly a uniform mix of almost finished compost, crumbly enough to begin parceling out piecemeal, first as a late-season covering in the vegetable garden, then across the lawn and garden beds.